Our boat, LAIKA, was named after our beloved Australian Shepherd who left us yesterday. She was a beautiful, agile and extremely smart dog that was as much a part of our family for 13 1/2 years as anyone could be. 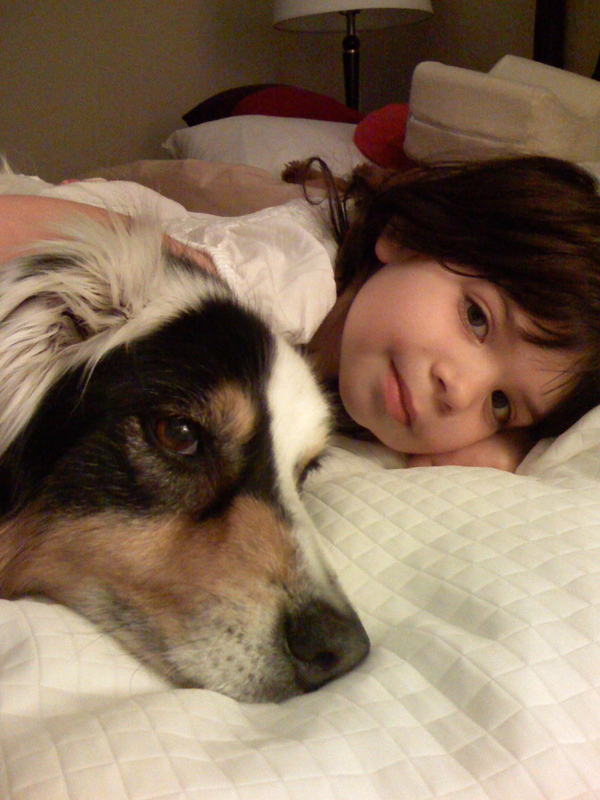 This picture was taken with her and Lila a few years ago on a trip to Vancouver, BC, probably on July 4th. Because Laika had such keen hearing and, like many Aussies, was sensitive to large noises, we’d travel out of the US every Independence Day – for her sanity. Vancouver, BC was a favorite destination not only because it’s such a nice city, but because many of the hotels are dog friendly. Laika was loving and sensitive. We always believed she had an unusual ability to sense when we were sad or in pain. If we were to bend over in pain, perhaps from stubbing a toe or tripping, Laika would bury herself underneath us and try to get us up. If we suffered a cut or expressed sadness, she would comfort us. Laika was incredibly bright. Early on she developed a unique and strong ability to memorize words and associate them with objects and tasks. It wasn’t uncommon for us to ask her about a favorite toy. She’d look around for it in our presence and, after not seeing it, would quickly start looking for it after we said things like “go find your orange squeaky ball.” We could tell her to go upstair and look and she’d dutifully head that way. We’d hear her run from room to room until, finally, we’d hear the squeaking. She recognized colors and shapes and could discern and select different toys by their names. Laika didn’t like German Shepherds. We don’t know why. From her earliest years, perhaps after seeing a bear near our home, she’d get into an aggressive and protective posture whenever encountering a German Shepherd. They sort of looked like bears. At least, that was our hypothesis. She learned the word too and would start darting her head from side to side looking for one if we even mentioned the breed by name. Trips to Luther Burbank on Mercer Island had to be infused with code words like “GS” whenever we saw one before her and wanted to prepare ourselves for her charge. It had become almost comical to see a 42 pound Aussie try and take on bigger, stronger German Shepherds. Laika was athletic and, like many Aussies and Border Collies, had superb jumping skills and coordination which lent themselves to extreme frisbee catching abilities. She would appear to fly through the air. She was also a member of a Flyball team and absolutely loved the game and the energy surrounding it. She was also an excellent swimmer and loved the water. Laika joined us on the boat many times this past year. While she probably didn’t enjoy the restrictiveness of the PFD she’d have to wear, I think she enjoyed the gentle vibrating rumble of the engines and, of course, being with her family. Laika, our dog, was named after the first dog in space. We will miss her very, very much and will think of her every time we’re on the water. That was a very lovely account of our Ms. Laika. I’m so glad we named the boat after her & will miss her every time I step foot in it. I will always remember her Doggie handle (the PFD) and how cute she looked in it. I wish she had had a chance to sit on the front in the breeze and enjoy the sun on her fur…. We will miss you Ms. Laika. I’m so sorry for your loss. Losing a pet is losing a family member. That was a lovely story – and very sweet photo. I lost my Aussie three years ago and still feel incredibly sad when I think of her. She had been my shop dog and constant companion for over ten years. I am so sorry for your loss. My friends say she would be unhappy that there is no longer a dog to take care of me. Perhaps they are right about all of us. Bill – we’re going to definitely consider another Aussie, probably toward the end of the summer. I don’t think we could really live too long without one having enjoyed Laika’s presence for the last 13 1/2 years. How about you getting another one too? There are lots to adopt that need good homes from places like http://www.aussierescuenw.org.